“You call it wrestling, they term it ‘working’ … As Shakespeare once said: ‘A rose by any other name,’ etc.” So Marcus Griffin began his groundbreaking 1937 book on the ins and outs of the pro wrestling business, Fall Guys: The Barnums of Bounce. It’s a good place to start, because any discussion of the grunt-and-groaners (as Griffin would call them) inevitably involves an examination of the artifice that undergirds the endeavor, and that artifice — be it the antediluvian secret that the whole show is a put-on, or the modern-day pretense that both actors and audience interact as if it’s legitimate — is itself bolstered by an intricate, seemingly inane vocabulary of lingo, idiom, and jargon. angle (n.) — A story line or plot in the wrestling product, as in, “They’re working a classic underdog angle.” It can be employed in either small-bore usage — i.e., the angle in a match — or in large-scale terms to describe a lengthy story. The term is borrowed from the archaic criminal/carnie phrase “work an angle,” which means figuring out a scam or finding an underhanded way to make a profit. Andre shot (n.) — A trick by which a camera is positioned beneath a wrestler, looking up, so as to make the wrestler look bigger. Famously used to make the 7-foot-4 Andre the Giant look even bigger than he was. workrate (n.) — A term for in-ring wrestling quality, used primarily by wrestling journalists to rate the physical and psychological performance of a match. The field of wrestling critique is often associated with journalist Dave Meltzer, who rates matches on a star scale; great matches throughout history are often referred to as “five-star matches” in reference to Meltzer’s rubric. …it’s all in “Grantland Dictionary: Pro Wrestling Edition,” along with illustrations like the one above (for “chain wrestling”). Check out Grantland‘s other delightful dictionaries here. 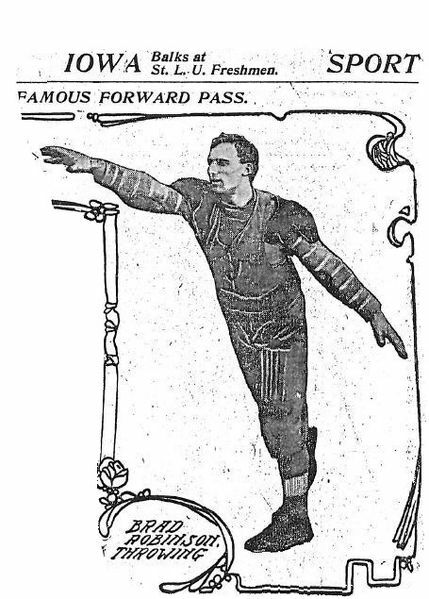 As we feel the frenzy, we might recall that it was on this date in 1906, in a game against Carroll College, that St. Louis University’s Bradbury “Brad” Robinson hit Jack Schneider with a 20-yard touchdown toss– the first legal forward pass in football.